My Guest Contributor series continues with another travel feature by Anna Mercer. Anna as readers of this space will known has studied at the University of Liverpool and the University of Cambridge. She is now in completing her thesis as an AHRC-funded doctoral candidate at the Centre for Eighteenth Century Studies, University of York. Her research focuses on the collaborative literary relationship of Percy and Mary Shelley. She won the runner-up Keats-Shelley Prize in 2015 for her essay on the Shelleys, which was published in the Spring 2016 issue of the Keats-Shelley Review. A new article on this subject is due to appear in the forthcoming issue of the same magazine. One of the great things about studying Shelley is where it can take you if you are intrepid. In the course of his short life he traveled to Ireland, Wales, Scotland, Devon, France, Switzerland and Italy - and some of the places he visited are among the most sublime and picturesque in Europe. I have an important trip planned to Lerici in Italy where he died and have both written and audio-visual material planned for publication in May. In the meantime enjoy Anna's record of her visit to Geneva and Chamonix. I myself made this trip and I can tell you it is absolutely stunning at any time of the year. You can watch my VLOG about my visit to the Villa Diodati here. In June 2016 I made a pilgrimage to an area in Europe known for its sublime scenery. I have read so much about the snowy peaks of the Alps and the shores of Lake Geneva, primarily from two sources that figure in my life because of my PhD research at the University of York. I am studying Percy Bysshe Shelley and Mary Wollstonecraft Shelley, two Romantic authors who, before their marriage but after their romantic union, spent the summer in the environs of Geneva and Chamonix in 1816, exactly 200 years before I arrived there. Percy Shelley had originally thought of leaving England for Italy. The Shelleys were instead convinced to head to Cologny near Geneva by their travellng companion Claire Clairmont, Mary’s step-sister, who in London had begun an affair with Lord Byron. On 13 May 1816 the Shelleys and Claire arrived in Geneva, followed on 25 May by Byron and his physician Dr. John Polidori. By June, both parties had taken residences close to each other on the shores of the lake; Byron stayed at the Villa Diodati. Incessant rain often prevented them from going out on the water in the evenings, and even stopped Percy, Mary and Claire from returning to their own lodgings. The eruption of Mount Tambora in 1815 has devastated the weather across Europe, and 1816 is recalled now as ‘the year without a summer’. The weather eventually cleared, and we explored the town. Like the Shelleys, we were intrigued by the literary greats who had graced the city, among the Rousseau. During the 1816 summer, Percy, Mary and Claire stayed at Maison Chapuis but often spent time at Byron’s grander lodgings nearby. Geneva is where Mary Shelley began writing her most famous and enduring novel, Frankenstein (first published in 1818). Mary’s terrifying novel – according to her 1831 introduction – was ostensibly inspired by a ‘waking dream’ she had after hearing Percy and Byron’s discussions on ‘the nature of the principle of life’ to which she ‘was a devout but nearly silent listener’. This account of her literary genius is characteristically modest, as her silence is in all likelihood overplayed; the community at Geneva in 1816 offered a stimulating intellectual environment and Percy and Mary collaborated on the novel as well as many other works. Mary began writing Frankenstein in June 1816. The Shelleys met Byron on 27 May, and he took up residence at Diodati on 10 June, and by June 22 Percy Shelley and Byron went on a tour of Lake Geneva together. So, although Mary only recorded the composition of Frankenstein in her journal in July, it is likely the novel was started between 10-22 June. In a previous post here at www.grahamhenderson.ca, I reviewed the excellent exhibition on Frankenstein at the Bodmer Foundation Library and Museum: Frankenstein: Creation of Darkness. We were treated with a walk around the grounds of the Villa Diodati itself. There is nothing […] in it that can repay you for the trouble of walking over its rough stones. The houses are high, the streets narrow, many of them on the ascent, and no public building of any beauty to attract your eye, or any architecture to gratify your taste. The town is surrounded by a wall, the three gates of which are shut exactly at ten o’clock, when no bribery (as in France) can open them (101-2). The lake is at our feet, and a little harbour contains our boat, in which we still enjoy our evening excursions on the water. Unfortunately we do not now enjoy those brilliant skies that hailed us on our first arrival to this country. An almost perpetual rain confines us principally to the house; but when the sun bursts forth it is with a splendour and heat unknown in England. The thunder storms that visit us are grander and more terrific than I have ever seen before. We watch them as they approach from the opposite side of the lake, observing the lightning play among the clouds in various parts of the heavens, and dart in jagged figures upon the piny heights of Jura, dark with the shadow of the overhanging cloud, while perhaps the sun is shining cheerily upon us. One night we enjoyed a finer storm than I had ever before beheld. The lake was lit up—the pines on Jura made visible, and all the scene illuminated for an instant, when a pitchy blackness succeeded, and the thunder came in frightful bursts over our heads amid the darkness (99-100). I am particularly fascinated by this jointly-authored publication History of a Six Weeks’ Tour, Mary’s first foray into print (besides her early light verses published in her father’s library). The text of this volume is an intermingling of voices, the provenance of each section being drawn from a joint journal, numerous letters and original words composed for the edition. I will be discussing the History in a paper at the British Association for Romantic Studies conference in York in July, 2017. On our first day in Geneva, after wandering around and dodging the rain, we immediately set off to cross the border. 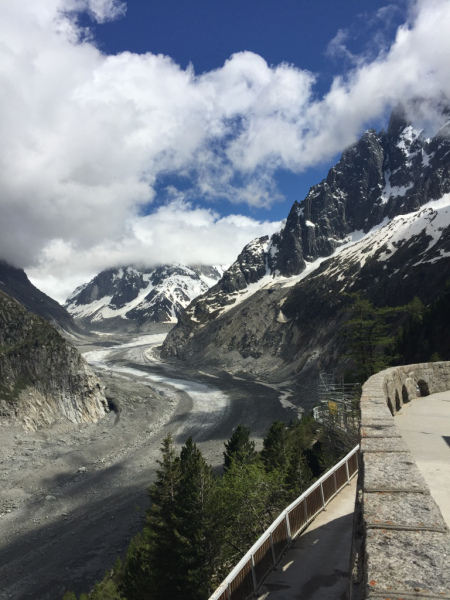 We were staying in an idyllic, isolated chalet in France, and the first place we wanted to visit the next day was the site of many inspirations for both Percy and Mary: the town of Chamonix, which rests under the imposing gaze of Mont Blanc, Europe’s highest peak. * Mary Wollstonecraft’s Letters from Norway. This excerpt concludes with a quotation taken from Mary Shelley’s mother, Mary Wollstonecraft. Her Letters written during a Short Residence in Sweden, Norway and Denmark inspired Mary in her own travel writing. This was a text in which the author sought ‘to let my remarks and reflections flow unrestrained’ (Advertisement). The writing of Mary Shelley’s radical parents (her father was William Godwin) were some of the texts the Shelleys were both reading – occasionally aloud together – in 1814, the year of their elopement, and their first journey to the continent. Texts included Letters written during a Short Residence by Wollstonecraft and Caleb Williams by Godwin. Despite the cloud, we decided to get the train to the ‘Mer de Glace’. Perhaps bad weather would have prevented tourists from making the journey in the Shelleys’ day, but in 2016 the Montenvers Railway (opened 1909) takes you right up to the viewing platform. On arrival, we were sorely disappointed, as we couldn’t see a thing. 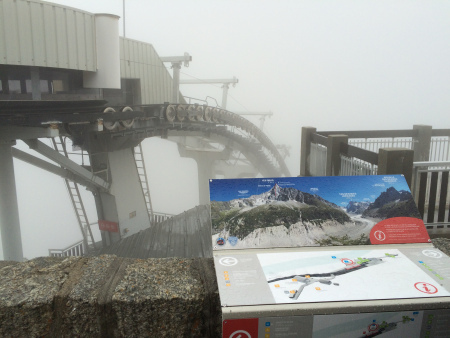 Mildly upset that we had traveled all this way up and wouldn’t see the glacier itself, my companion convinced me to take the cable car that descends into the mist despite the slightly miserable conditions. We have returned from visiting the glacier of Montanvert, or as it is called, the Sea of Ice, a scene in truth of dizzying wonder. The path that winds to it along the side of a mountain, now clothed with pines, now intersected with snowy hollows, is wide and steep. […] We arrived at Montanvert, […] On all sides precipitous mountains, the abodes of unrelenting frost, surround this vale: their sides are banked up with ice and snow, broken, heaped high, and exhibiting terrific chasms. The summits are sharp and naked pinnacles, whose overhanging steepness will not even permit snow to rest upon them. Lines of dazzling ice occupy here and there their perpendicular rifts, and shine through the driving vapours with inexpressible brilliance; they pierce the clouds like things not belonging to this earth. The vale itself is filled with a mass of undulating ice, and has an ascent sufficiently gradual even to the remotest abysses of these horrible desarts. It is only half a league (about two miles) in breadth, and seems much less. It exhibits an appearance as if frost had suddenly bound up the waves and whirlpools of a mighty torrent. We walked some distance upon its surface. The waves are elevated about 12 or 15 feet from the surface of the mass, which is intersected by long gaps of unfathomable depth, the ice of whose sides is more beautifully azure than the sky. In these regions every thing changes, and is in motion. This vast mass of ice has one general progress, which ceases neither day nor night; it breaks and bursts for ever: some undulations sink while others rise; it is never the same. The echo of rocks, or of the ice and snow which fall from their overhanging precipices, or roll from their aerial summits, scarcely ceases for one moment. One would think that Mont Blanc, like the god of the Stoics, was a vast animal, and that the frozen blood for ever circulated through his stony veins. We dined (M***, C***, and I) on the grass, in the open air, surrounded by this scene. The air is piercing and clear. We returned down the mountain, sometimes encompassed by the driving vapours, sometimes cheered by the sunbeams, and arrived at our inn by seven o’clock (History of a Six Weeks’ Tour, 164-168). However, we were not just relieved to be able to see more than cloud, but shocked by the lack of glacier before us. Carl Hackert, ‘Vue de la Mer de Glace et de l’Hôpital de Blair’ (1781) (Centre d’iconographie genevois). Percy Shelley’s premonition that Buffon’s ‘sublime but gloomy theory’ that ‘this globe which we inhabit will at some future period be changed into a mass of frost’ (161-2), was entirely unfounded. We knew that the ice was melting – the majority of us do (I am avoiding any political comment here) – but we were still affected by this huge difference across the decades. You can read more on this subject at the British Romantic Writing and Environmental Catastrophe website, an AHRC-funded project at the University of Leeds. It was nearly noon when I arrived at the top of the ascent. For some time I sat upon the rock that overlooks the sea of ice. A mist covered both that and the surrounding mountains. Presently a breeze dissipated the cloud, and I descended upon the glacier. From the side where I now stood Montanvert was exactly opposite, at the distance of a league; and above it rose Mont Blanc, in awful majesty. I remained in a recess of the rock, gazing on this wonderful and stupendous scene. The sea, or rather the vast river of ice, wound among its dependent mountains, whose aerial summits hung over its recesses. Their icy and glittering peaks shone in the sunlight over the clouds. My heart, which was before sorrowful, now swelled with something like joy. On our way back to Chamonix, we had the same luck again – an overwhelming sight. We returned two days later in marginally better weather to take the cable-car that made the ascent of Mont Blanc itself. To be honest, the cloud had left me confused as to where the peak of this infamous mountain was. A ride up the side of the mountain to the Aiguille Du Midi took my breath away. This trip is a must for any visitor to the area. We were warned that the visibility would be bad at the top, but when we arrived the clouds cleared and left us with spectacular views. 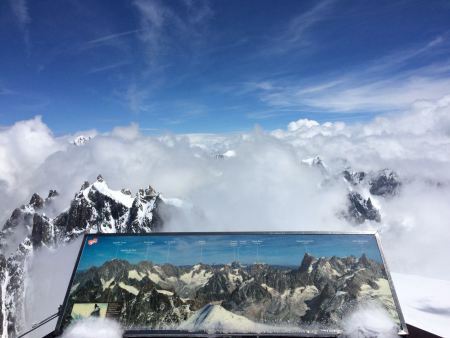 If you are a lover of the Shelleys, you will be further mystified in wondering just what those two incredible authors would have made of the sight, if they could have ascended to 3,842m and see the ‘vast animal’ Mont Blanc this close. This article is reprinted with the kind permission of the author. It originally appeared 6 February 2017 on her excellent blog which you can find here. All details from MWS Journals, 103-108. Nb. No journal by Mary (lost) from 13 May 1815 – 21 July 1816. ‘The impression given by these accounts [Mary Shelley’s intro, PBS’s preface and Thomas Moore] is of a leisurely time-scheme, yet it must in fact have been fairly brief: Byron met Shelley’s party at Sécheron on 27 May, and did not move to the Villa Diodati until 10 June; the journey round Lake Leman began on 22 June, and the novel must have been started between these last two dates’. M. K. Joseph ‘The Composition of Frankenstein’ in Frankenstein ed. J. Paul Hunter (London: Norton, 1996 repr. 2012), 171. MWS, Journals, 22, 26, 649-50, 684.